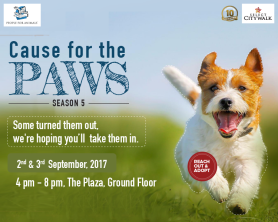 You can do your bit for our legged friends by visiting Cause 4 Paws season 5. Let’s find these dogs a loving home and find you a friend with unconditional love. Supported by Scoory Scrub, Pet Bytes, Heads up for Tails & Fauna Police.